Nearly 11 months after their split, Patrick Dempsey and his estranged wife Jillian Fink were spotted together over the weekend. On Sunday, the two were seen enjoying some time together in Paris, and even took selfies together. Jillian posted a photo of herself on Instagram and wrote, "Grand Palais #picasso.mania #Paris." This is the first time that Dempsey and Fink have been spotted together since she filed for divorce in January after 15 years of marriage. Dempsey is currently shooting his upcoming film "Bridget Jones's Baby" in London with Renée Zellweger. Fink is overseas for a "The Hunger Games: Mockingjay — Part 2" promo tour, serving as Jennifer Lawrence's makeup artist. 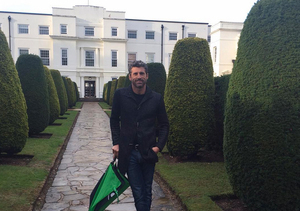 See Patrick Dempsey's 'Bridget Jones's Baby' Instagram Post!